Who doesn’t love new baked goods? We’ve got two new loves for your one true love to try this February; a raspberry-filled white chocolate duffin, and two different flavours of madeleines. Share the love this Valentine’s Day with these delicious, limited-time creations! If you often find yourself dreaming of our duffins, you’re going to have a field day with our special Valentine’s creation: The Love Duffin! A duffin is essentially the lovechild of a muffin and a donut (hence the name), and our latest flavour is one you don’t want to miss. To put a new twist on things, this delightful Valentine’s treat is dipped in delicious white chocolate ganache, and then sprinkled with little red hearts. And that’s not all – the filling of seasonal raspberries makes them fabulously fruity and even a little flirty. Perfect for February 14th! Never tried a madeleine? You simply haven’t lived. Raspberries are all the rage right now, and so it should come as no surprise that our madeleines can be enjoyed in either raspberry or chocolate raspberry. So what’s their story? These delicate shell-shaped cakes are as soft as they are sweet, and rumour has it they earned their name because Louis XV wanted to honour his father in-law’s chef, Madeleine Paulmier. He first tried them in France in 1755, at the Chateau Commercy in Lorraine. Once his wife tried them, she introduced them to everyone else and soon they were the talk of the town. From Versailles to Australia, they’ve travelled a long way – but they’re still every bit as good (plus, we bake them freshly in store each day). 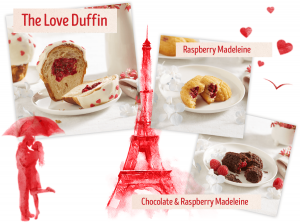 Share the love this February with our delightful Love Duffin and mouth-watering madeleines. These treats are only available for the month of February, so hurry to your local Muffin Break now!